Plentiful sunshine. High 76F. Winds NW at 10 to 20 mph..
A few passing clouds, otherwise generally clear. Low 46F. Winds WNW at 10 to 20 mph. Get nose to beak with the largest bird on earth at the Indian Point Ostrich Ranch. Nestled in the Cummings Valley the working ostrich ranch is one of the largest ranches in the Western United States. 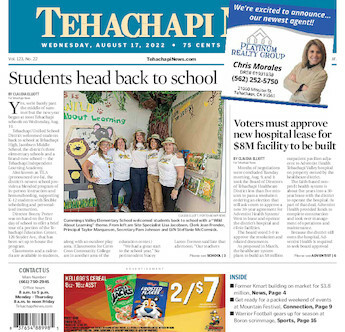 Tehachapi has numerous pet and animal rescue operations. See the “Tehachapi Pet & Rescue News” in the The Weekender (published Fridays) for an up to date list and animals available for adoption.